Home health health news healthy salt sugar video worldhealthinfo Most People View Sugary Foods as Tasty, Satisfying and Irresistable Treats...But They Don't Know This! Most People View Sugary Foods as Tasty, Satisfying and Irresistable Treats...But They Don't Know This! With the government constantly decreasing the recommended daily allowance (RDA) for sugar, most of us are conscious about how much of it we add to our coffee or sprinkle on our cereal. Sadly enough though, sugar is hidden it mostly every processed food you can buy, and you may be eating a lot more of it than you thought. We know to stay away from sugar laden cookies, ice cream and soda, but hidden sugar is also packed into breads, meats, and even condiments such as Worcestershire sauce and ketchup. We have known for a while that sugar is bad for your health, but studies are constantly showing just how bad, and it turns out sugar is just about one of the most toxic, harmful things you can ingest. 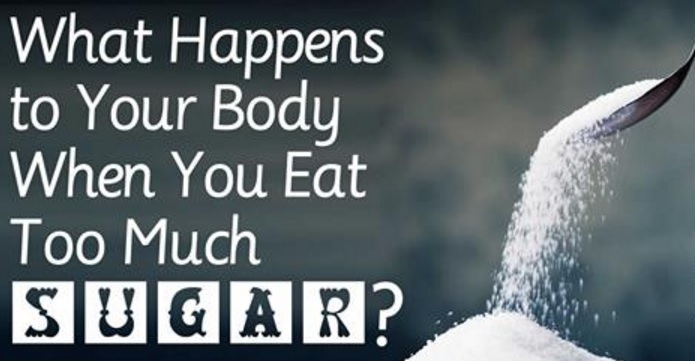 In February 2015, the Washington Post did a story on sugar using grams (4 grams = 1 tsp). They quoted Euromonitor's study, which said Americans are now consuming 126 grams, which would equal close to 32 teaspoons a day. Most concerning of all perhaps is that most sugar that is consumed is in the form of high-fructose corn syrup (HFCS). This is a form of highly processed sugar is cheaper to make and 20 percent sweeter than regular table sugar, hence why so many food manufacturers are eager to use it. The human body is not equipped to consume high amounts of sugar, particularly in the form of fructose. Your body actually metabolizes fructose differently than sugar - it is a hepatotoxin and is metabolized directly into fat. Dr. Robert Lustig, a professor of Clinical Pediatrics in the Division of Endocrinology in the University of California and a pioneer in decoding sugar metabolism, says that your body can only safely metabolize at least six teaspoons of added sugar per day. It increases your uric acid levels. High uric acid levels are a risk factor for heart and kidney disease. In fact, the connection between fructose, metabolic syndrome, and your uric acid is now so clear that your uric acid level can now be used as a marker for fructose toxicity. Eating too much sugar actually can do the same amount of damage to your body as drinking excesseive amounts of alcohol. One study also found that fructose is readily used by cancer cells to increase their growth, in effect it "feeds" the cancer cells, promoting cell division and speeds up their growth, allowing the cancer to spread faster. Sugar in it's natural for is not very bad for you, especially when eaten in moderation, it is the sheer amount of sugar that is hidden in processed foods that is dangerous for your health. You should aim to spend about 90% of your grocery budget on whole foods and the remaining 10% on processed foods. Refined carbohydrates such as waffles, cereal and bagels should be avoided or eaten in extreme moderation as they break down into sugar when they are broken down in the body, creating in insulin spike which upsets your insulin levels. Fructose should be less than 25 grams a day, and the majority should come from whole fruit. Avoid artificial sweeteners like aspartame also, as these have proven to often be worse for you than eating sugar. Increase your consumption of healthy fats, such as omega-3, saturated, and monounsaturated fats. Your body needs health-promoting fats from animal and vegetable sources for optimal functioning. In fact, emerging evidence suggests that healthy fats should make up at least 70 percent of your diet. Some of the best sources include organic butter from raw milk, (unheated) virgin olive oil, coconut oil, raw nuts like pecans and macadamia, free-range eggs, avocado, and wild Alaskan salmon.